Only 4 minutes' walk from the Main Market Square and 6 minutes from Krakow Railway Station, Blue Aparthotel combines an excellent location with affordable rates. You can choose between brightly decorated, air-conditioned rooms with private bathrooms complete with a hairdryer. 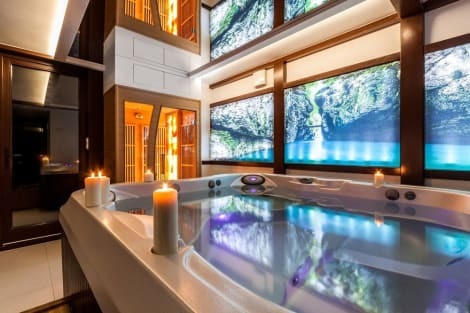 They all feature a flat-screen TV. A refrigerator and a tea/coffee making set are also offered. Cleaning service is provided daily. Breakfast is included in the price of your room and Wi-Fi is free. Blue Aparthotel is open 24/7 and features a lift. Laundry facilities and airport shuttle are also available. All the attractions and entertainment of Krakow's Old Town are within easy walking distance of Blue Aparthotel. A stay at Wyspianski Hotel places you in the heart of Krakow, within a 10-minute walk of Main Market Square and St. Mary's Basilica. This hotel is 0.4 mi (0.6 km) from Cloth Hall and 0.4 mi (0.7 km) from Krakow Barbican. Take advantage of recreation opportunities such as an attached winery or take in the view from a terrace and a garden. Additional amenities at this aparthotel include complimentary wireless Internet access, concierge services, and a television in a common area. Make yourself at home in one of the 31 air-conditioned rooms featuring flat-screen televisions. Complimentary wired and wireless Internet access keeps you connected, and satellite programming provides entertainment. Bathrooms have complimentary toiletries and hair dryers. Conveniences include a turndown service, housekeeping is provided daily, and irons/ironing boards can be requested. WIT STWOSZ HOTEL*** is located right next to the Main Market Square, the largest medieval square in Kraków and indeed Europe. We are close to everything: the Wawel hill, the "Lady with an Ermine" by Leonardo da Vinci, Sukiennice (the Cloth Hall) with gargoyles, to St. Mary Basilica with the miraculous altar made by Veit Stoss, the Renaissance tenement houses surrounding the market. You can feel this unique atmosphere of magical Kraków. The 14th century tenement house on Mikołajska 28 Street always belonged to St. Mary's Basilica and after many history turns, it has returned to its owner. Especially for our guests vintage interior have been swapped for an intimate hotel where peace and tranquility reigns. We offer single, double, twin and triple rooms and a luxury suite. Each of them has a private bathroom with shower, LCD TV, satellite TV, telephone, air conditioning, deposit box and free Wi-Fi. Our medieval underground hide refined "stone" restaurant. Near the hotel there is a secured car park. Hotel has an elevator to the third floor and access to free wired and wireless internet. We provide that we will do our best to create comfortable conditions for your work and leisure. There is a paid, guarded parking nearby. Booking conditions: - it is necessary to make a reservation in advance on the parking place (phone number given by reception desk) - payment at the parking place WE LOOK FORWARD TO YOUR STAY! Make yourself at home in one of the 29 guestrooms featuring microwaves. Prepare your meals in the shared/communal kitchen. Complimentary wireless Internet access is available to keep you connected. Private bathrooms with showers feature complimentary toiletries and hair dryers. A stay at Hotel Ascot places you in the heart of Krakow, within a 10-minute walk of St. Mary's Basilica and Krakow Barbican. This hotel is 0.6 mi (0.9 km) from Main Market Square and 0.5 mi (0.8 km) from Cloth Hall.